Lasik surgeons downplay complications of Lasik. Afterall, they are trying to sell you an unnecessary surgery that places your most precious sense -- your eyesight -- at significant risk. We've seen Lasik surgeons falsely claim that no one has ever gone blind from Lasik. Not true! You can go blind from Lasik. Total blindness -- meaning, no light perception -- from Lasik is extremely rare, but it has happened. Legal blindness, which is defined as visual acuity of 20/200 or less with glasses, has occurred as a result of Lasik far more often than Lasik surgeons will ever admit. There are no hard statistics on blindness after Lasik, primarily because no one is tracking Lasik complications. FDA law requires that Lasik clinics report serious complications of Lasik, but virtually no Lasik surgeon complies with this law. Since you can't trust a Lasik surgeon to tell the truth about Lasik complications and risk of blindness after Lasik, we created this web page in the hopes that you'll be convinced not to risk your eyesight. Actually, blindness is not the worst known outcome of Lasik. Some patients have committed suicide due to Lasik complications, and others have attempted suicide. A 37 year old woman had LASIK in July 2017 after being misled into believing that the surgery is safe. She immediately had a problem with one eye. Her surgeon tried various treatments, but her eye continued getting worse. A few months later she sought a second opinion from another eye doctor who diagnosed her with mycobacterium chelonae infection. Because the infection raged for so long her cornea was destroyed. She is now blind in that eye and in constant pain. Her only hope to recover her vision is to find a doctor who can get the infection under control and then to undergo a corneal transplant. The toll that this situation has taken on her life is enormous. She feels she is no longer able to be there fully for her 3 children. The stress and depression has caused other health issues, and she has withdrawn socially. She is sharing her story in the hope that it may save someone else from becoming a victim. Claire had Lasik in 2014. A second Lasik surgery was needed on her left eye, which caused a retinal detachment. Claire underwent surgery to repair her retina, but the surgery failed and led to a cataract. Claire then underwent cataract surgery, which led to a spike in her intraocular pressure. This led to need for yet another surgery to implant a valve inside her eye to regulate her intraocular pressure. This surgery also went horribly wrong. Her eye pressure dropped too low and destroyed her vision. Claire's eye was left totally blind with malignant glaucoma and no pupil. Her eye was so painful that Claire had to undergo evisceration surgery on January 30, 2017. Claire now has a prosthetic eye. Claire's story is an example of what we call "the domino effect of unnecessary eye surgery". The image below is a photo of Claire's eye after the evisceration surgery. The image below is a photo of Claire's eye taken before the evisceration. Over 5 years ago I had LASIK surgery. Then PRK was performed on the right eye only, for a better result. Approximately a week later I noticed deteriorating vision and flashes in that right eye. I immediately went to the doctor that performed the surgeries. He immediately said it was "not from the PRK" and sent me on my way. My husband is an internist and after speaking with him he contacted my neurologist and they got me in for an MRI, thinking it was possibly a tumor of some sort. I then went to his office where the neurologist told us the MRI showed no abnormalities. So he looked then in my eyes. He immediately saw that it was indeed a detached retina. This process took about 2 more days. I did go immediately to have the surgery by a retinal specialist, to repair and reattach the retina. It attached for about 2 weeks. Then over the course of a year detached 4 more times. I had surgery a total of 5 times, always following the face down protocol of "face down chair time" of 10 days face down for EACH surgery. On the last surgery my eye could take no more and I had a choroidal hemorrhage within the eye. They saved the eye during surgery. But I now have NO vision in that right eye. I could deal with that if it wasn't for the pain I've dealt with on and off. I do autogolous blood drops. That helps. I use steroid drops 4 times a day. But my pressure has now dropped to a 3. Usually a 6. If the pump in the back of the eye stops working because of the scar damage inside , my pressure (eye filled with oil) will go down more and they (current retinal specialist) want to remove the eye. I'm in my 40's and have 3 kids. It's difficult to be outside at my sons travel baseball games. The pain is on and off , but not terrible now. I've seen one VERY GOOD eye DR in St. Louis MO, who suggested keeping eye as long as possible, but there was not much else he could do for the pain. It's really taken a toll on the family as I don't drive at night, depth perception is terrible. I'm not quite as nice of a mom while in pain. The photo below is the eye of a patient of Dr. Edward Boshnick who had LASIK surgery. Some time after Lasik this patient suffered a total retinal detachment, which resulted in blindness with no light perception. About nine years later, the LASIK flap split apart separating the anterior cornea from the underlying corneal tissue. Also, the outer cellular layer of the cornea -- the epithelium -- began to separate from the underlying cornea. As a result of all the damage to the eye, scar tissue and blood vessels covered the cornea, and the cornea lost transparency. Sekeroglu, et al. 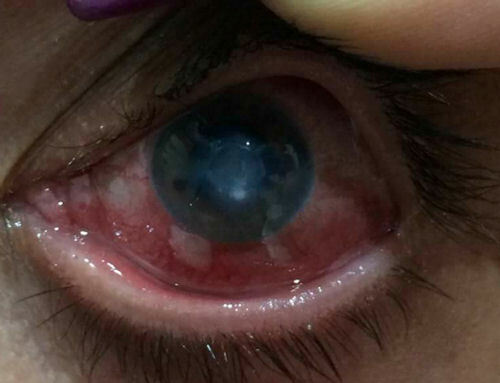 A Rare Devastating Complication of Lasik: Bilateral Fungal Keratitis. J Ophthalmol. 2010;2010:450230. Purpose. To report an unusual case of severe bilateral fungal keratitis following laser in situ keratomileusis (LASIK). Method. A 48-year-old man developed bilateral diffuse corneal infiltration two weeks after LASIK. The corneal scrapings revealed fungal filaments but cultures were negative. Results. 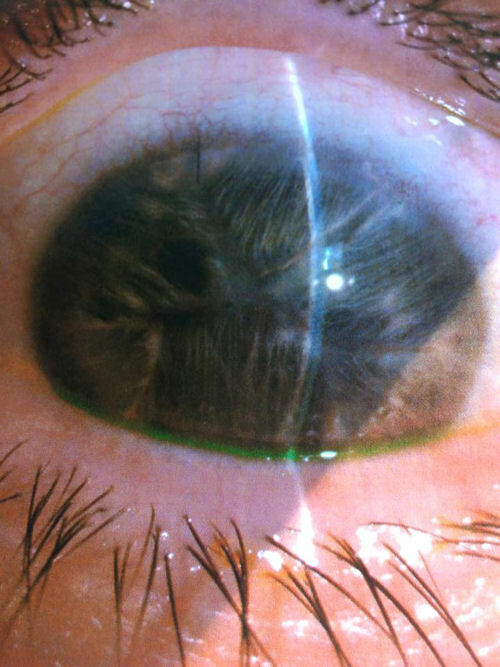 The corneal ulceration was improved on the left eye whereas spontaneous perforation occurred and finally evisceration [removal of the eye] was needed on the right eye despite topical and systemic antifungal treatment. Conclusions. Fungal keratitis, especially with bilateral involvement, is a very rare and serious complication of LASIK surgery. Clinical suspicion is crucial because most of fungal keratitis are misdiagnosed as bacterial keratitis and can lead serious visual results, even eye loss. Sylvie M. Velou, MD; Joseph Colin, MD. Disastrous Complications Following a Bilateral, Same-Day Laser In Situ Keratomileusis (LASIK) Procedure. Arch Ophthalmol. 2002;120(12):226-227. Excerpt: "On the left eye, the procedure was complicated by corneal perforation, probably due to misassembly of an older-generation microkeratome with a removable spacer plate. Despite surgical repair, the outcome was very bad and on the day of our examination, 1 year after surgery, she had no light perception and the slitlamp findings showed phthisis bulbi." September 3, 1999 FDA Advisory Committee Meeting transcript. Leo J. Maguire, MD: "I think what we are interested in is trying to avoid all complications in refractive surgery as much as possible, paying particularly attention to more catastrophic complications. What happens is that a lot of these things are related to each other. So, I think one way of looking at the problems is to start with the more catastrophic complications observed in Lasik and work down. Certainly the most catastrophic complication in Lasik I have seen is guillotining of the anterior segment, leading to loss of the eye and light perception. That is catastrophic, and that can happen. And, I have one patient who I take care of for somebody else where something equivalent to that has happened." Link to transcript, see page 62.